The aim of the Wolfgang Detail, to remove surface defects, enhance the paint and lay down paint protection and incredible gloss. We have introduced the Wolfgang Detail for customers who still desire a good level of perfection but do not have the budget of our increasingly popular Ceramic Paint Protection. The Wolfgang Detail is also recommended if you regularly enjoy maintaining your own vehicle with Wax or Paint Sealants. Note: The Wolfgang Detail is NOT a Paint Correction, therefore the amount of surface defects removed will be dependent on your type of paint and the severity of defects on the paintwork. We do, however guarantee insane levels of GLOSS and REFLECTION! 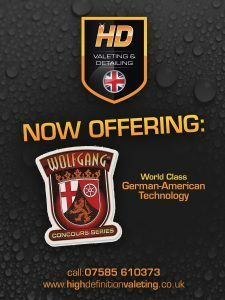 Wolfgang are a German-American Technology who are renowned for their quality of car care products. Some of the world’s best Detailer’s use Wolfgang including Mike Phillips of Auto-geek, see bio http://www.autogeek.net/mike-phillips-bio.html. As standard we finish off with Wolfgang Deep Gloss Paint Sealant 3.0. But, there is an option to upgrade to Wolfgang Fuzion Hybrid Carnauba Wax for £40.00 (multiple layers). Fuzion has maximum gloss and protection with a fusion of white carnauba and German polymers.